The value of access control systems is more and more appreciated by people in Ontario and it is the job of FC Locksmith to see that clients have what they need in terms of equipment. 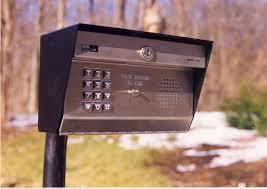 If good locks are the base of good security, modern telephone entry systems come to supplement and reinforce security. As valuable equipment for both homes and companies in Toronto, our company has perfect knowledge of their variations and great expertise in their repair services. Our assistance will be useful in the level of technical services but also consultation and that’s why our staff is here to take your questions and respond to your needs for every entry intercom. We know details about different Toronto Telephone Entry Systems. Each system is designed for the purpose of suiting the needs of different properties. They can be connected with the telephone line you already have or they can come with a different line. They can facilitate access for even thousands of people and often come with CCTV systems since the advantage of phone intercoms is for you to have both audio and visual communication with the visitor. In either case, our expertise starts with our ability to provide telephone entry systems installation and extends to their repairs. The specialized teams of our company can install phone intercoms designed for a small family or a huge office building. We properly connect the system with an entrance keypad and are experts in the most available high tech equipment on the market. We are familiar with all of them and that’s why we can install perfectly a telephone entry system with camera but also take care of any problems. Our technicians do not only have experience and proper training for all these services but keep improving their skills with constant updating with new products. That’s what makes us experts in Telephone Entry Systems in Toronto and that’s why we can promise excellence in every service.